As iconic foods go, hot dogs are as American as apple pie. And as word associations go, "kosher" and "hot dog" is as natural a pairing as "hot dog" and "mustard." But relative to the US population, kosher-observant Jews make up only a tiny fraction of food consumers. So what makes the kosher hot dog so outrageously popular, even among those who don't actually keep kosher for religious reasons? The exact origins of the American hot dog are unclear, but according to the National Hot Dog and Sausage Council, food historians generally agree that it evolved from the frankfurter sausage, which has its roots in Germany. Accounts vary, but the popular sausage -- dubbed a "dachshund," after the little German hound that shares its shape -- may have developed as early as the late 1400s. By the 1800s, when German and Eastern European immigrants began arriving in America en masse, the "little dog" sausage was a part of their culinary repertoire and came along for the ride to American shores. Major cities with large immigrant populations were prime places for Americans, new and old alike, to gain exposure to novel foods or to enjoy familiar ones from a far-away homeland. New York City's Lower East Side, for example, was both home to a high concentration of immigrants, and a bustling commercial center. Food carts offering filling, inexpensive, easy-to-transport foods were popular with the working class; a small sausage on a bun would have had easy appeal. A large population of Jewish immigrants lived and worked on the Lower East Side, and, whether they partook or not, got plenty of exposure to the diverse food culture that surrounded them. Many Jews held fast to the kashrut laws they'd practiced in the Old World, as evidenced by the kosher butchers, restaurants, and grocers that thrived in the neighborhood. But others experimented with new foods as they acclimated to America. Some flouted the kosher laws deliberately, in an attempt to embrace a "modern" American lifestyle, while others attempted to adapt and integrate American foods into kosher cookery. Because the Jewish Dietary Laws include such specific, stringent requirements for the slaughter and consumption of meat, kosher butchers have always been integral players in Jewish communities. Enterprising butchers had the expertise and ingredients to create a kosher beef version of the non-kosher pork-based hot dog recipe. The name of the first kosher hot dog-maker may be lost to history, but we do know that the Hebrew National Kosher Sausage Factory, established in 1905, was turning them out on the Lower East Side. When Romanian butcher Isadore Pinckowitz bought the company in 1928, he started selling Hebrew National hot dogs to New York delis, which enjoyed popularity among Jews and non-Jews alike. By the 1940s, Hebrew National was positioning itself in suburban supermarkets; in the 1960's with ads asserting "We answer to a higher authority," Hebrew National captured a large, loyal base of consumers convinced that, at least in the case of hot dogs, kosher was better. The fact Germans called frankfurters "dachshunds" or "little dogs" probably has a lot to do with the American hot dog's moniker. But as Home Cooking Guide Peggy Trowbridge Filippone points out, the name didn't always have a positive connotation in America. Rumors even circulated that hot dogs sometimes contained dog meat or unsavory animal parts. Savvy non-Jewish consumers, however, knew that Jews were forbidden to eat dogs, horses, and other animals many feared could make their way into sausages. 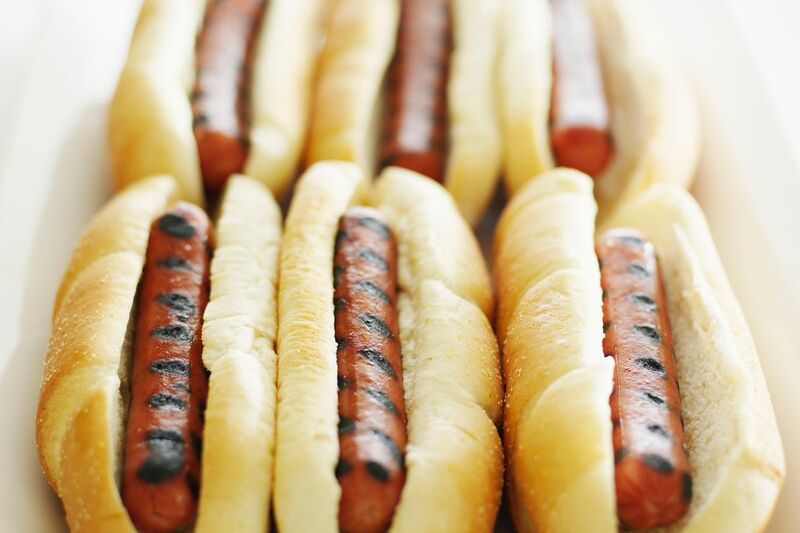 Choosing a kosher hot dog was seen as a guarantee that the ingredients were cleaner, safer, or more wholesome, even though the kashrut of a food isn't dependent upon these attributes. If hot dogs and baseball are pure Americana, then the popularity of the kosher hot dog carries symbolic meaning, too. For kosher-observant Jews, they're the only option. When non-Jews line up for them at MLB ballparks or choose them for summer barbecues, it suggests, however subtly, acceptance of or interest in their Jewish neighbors. And for those who keep kosher for religious reasons, being able to enjoy a hot dog at a baseball game like everyone else can feel pretty liberating. Consider, too, the bagel dog, that dough-wrapped novelty of 1980's Jewish deli fare. A clever merger of the bagel and kosher hot dog, they became popular enough as a take-out item that for a time, they were easily found in the freezer section of many supermarkets across the country. As tastes and food trends have evolved, they're harder to find, but nostalgia for the treat has inspired plenty of recipes for DIY bagel dogs. Kosher Hot Dogs: Better, or Just Different? As for whether kosher hot dogs are "better," that's largely a question of personal taste. For consumers who don't keep kosher, those who choose kosher hot dogs often cite a preference for the garlicky spice blend typical of kosher beef franks over the smokier flavor of pork hot dogs. And for Muslim consumers who may have trouble tracking down hot dogs with Halal certification, a kosher label indicates that the hot dogs are pork-free, humanely-slaughtered, and blood-free, and therefore permissible. Incidentally, Hebrew National's kosher status has been a controversial issue over the years. Among Orthodox Jews, there are many that question the validity of the Triangle-K, the kosher certifying agency that provides Hebrew National's current hashgacha. But whether Hebrew National hot dogs are legitimately kosher may be beside the point -- the majority of the company's consumers don't keep kosher and aren't Jewish. They're just folks who think kosher hot dogs are the best.